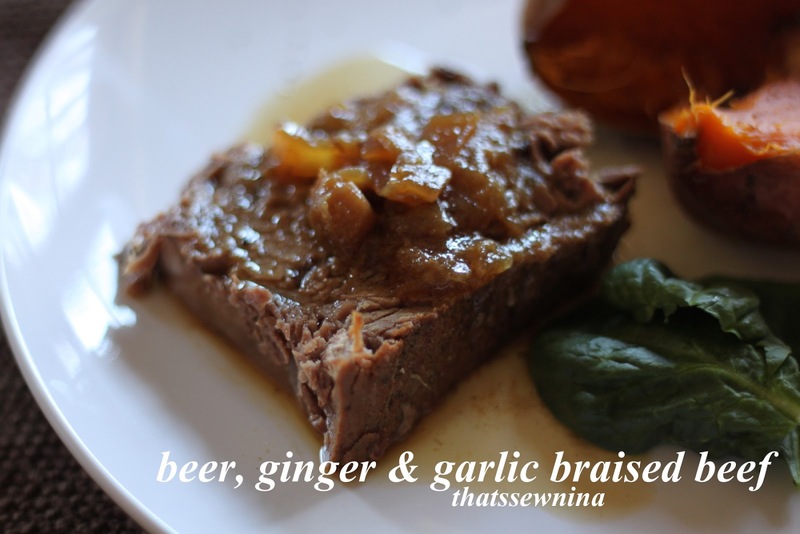 It was Mother’s Day this weekend so we decided to do something a little special for our make-ahead meal this week and make a beef roast! A big, ‘ol pot roast is a perfect make-ahead meal. It’s slow cooked and delicious and whatever you don’t get to in a few days you can shred up and throw in the freezer for sandwiches on another day when life has gotten the better of you and you need a quick easy dinner. We’ve made a ton (I mean it, a ton!) of beef roast recipes but our one of our all time favorites is from Aarti Sequeira. She uses a beef brisket for her recipe but we’ve tried a few different beef cuts and they all seem to work pretty well. The recipe is a little different with the use of ginger, cloves, cardamom and cinnamon. They add a touch of sweet spice to the onion sauce. Yum! Preheat the oven to 325 degrees F. Warm the oil in a large, ovenproof Dutch oven over medium-high heat until shimmering. Season the brisket with salt and pepper on both sides, and then add the meat to the pot. Brown on all sides, about 10 minutes total. Remove from the pot and set aside on a plate. Turn the heat down to medium and add the cinnamon stick, cloves, and cardamom pods; they should sizzle upon contact with the oil in the pot. Once they start releasing their aroma (less than 1 minute), add the onions and Ginger-Garlic paste. Sprinkle with a touch of salt to help them release some moisture. Saute until they soften and turn golden, about 10 minutes. Stir in the sugar and beer to the pot, scraping up any bits that may have stuck to the bottom. Carefully, using a pair of tongs, return the brisket to the pot. Then add enough broth to bring the liquid halfway up the brisket, about 1 cup. Bring the liquid to a boil, shut off the heat, cover, and transfer to the oven where it will cook away for 3 hours until it's very tender. Remove the lid in the last half hour of cooking to reduce the liquid. When you're ready to serve, check the gravy. Stir in the cider vinegar. If it's too thick, don't be afraid to add a little water to thin it out. If it's too thin, reduce it on the stovetop. Taste for seasoning; depending on the brand of broth you used, you may want to add a little more salt. When slicing the brisket, remember to slice across the grain, that way you'll get the most tender pieces of meat. Spoon a little gravy over the top and enjoy a slice of brisket heaven! Throw the garlic, ginger, and canola oil in a mini-food processor or blender and let it go until it forms a semi-smooth paste. There will still be tiny little pieces in there, but overall, it should resemble a paste.